26 www.seniorshousingbusiness.com Seniors Housing Business n October-November 2017 is pleased to announce 3 new senior properties coming to Florida! > > O v e r 3 5 y e a r s o f e x p e r i e n c e i n 5 5 + I n d e p e n d e n t L i v i n g L i t e Coming soon to Sarasota, FL The Belmond at University Groves – 183 units Coming soon to Stuart, FL 182 units Coming soon to Palm Beach Gardens, FL Arcadia Gardens – 220 units For questions about United Group, its senior portfolio, or third-party management opportunities, please contact U G O C . c o m • i n f o @ u g o c . c o m • ( 5 1 8 ) 6 8 7 - 7 3 0 0 United Group continues to add to its senior portfolio: >> Diamond Oaks Village – Bonita Springs, FL >> Diamond Rock Terrace – Troy, NY >> Glenmont Abbey Village – Glenmont, NY >> Greenwood Apartments – Lake Placid, NY >> Hearthstone Village – Latham, NY >> Lodge at BridgeMill – Canton, GA >> Midrise Apartments – Mechanicville, NY >> Sandalwood Village – Naples, FL >> Schaffer Heights – Schenectady, NY >> Schuyler Commons – Utica, NY >> Wallkill Living Center – Middletown, NY >> The Belmond at Univ. Groves – Sarasota, FL >> Arcadia Gardens – Palm Beach Gardens, FL >> 182 Age-Restricted Units – Stuart, FL in Santa Clara, Calif. The study revealed six different marketing labels for age-restricted apart- ments in Santa Clara as well as in various parts of the Bay Area, where Gerard pulled data. Terms abound, including senior apartments, 55-plus apartments, independent senior living for 55 years and above, luxury adult apartments, and so on. "Every conversation you have about 55-plus rentals starts off with what is it and what is it not?" explains Gerard. "Descriptions of this one sector, all targeting the same consumer, are all over the board." Troy, N.Y.-based United Group is actively developing as well as growing its third-party manage- ment portfolio in the 55 and older age-restricted rental housing sec- tor. It also offers a product called "independent living (IL) lite," which is differentiated from the age-restricted model by a larger clubhouse and catered food ser- vice offerings. 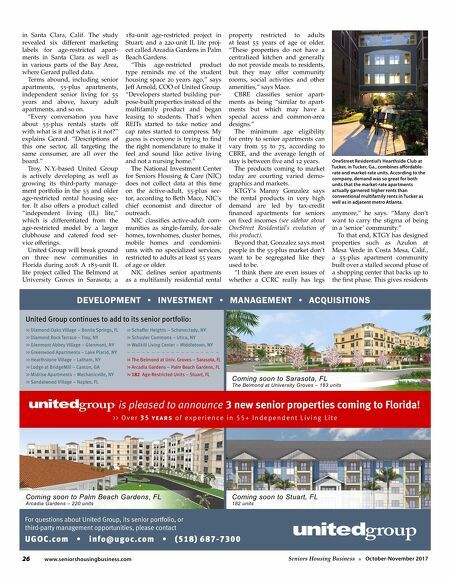 United Group will break ground on three new communities in Florida during 2018: A 183-unit IL lite project called The Belmond at University Groves in Sarasota; a 182-unit age-restricted project in Stuart; and a 220-unit IL lite proj- ect called Arcadia Gardens in Palm Beach Gardens. "This age-restricted product type reminds me of the student housing space 20 years ago," says Jeff Arnold, COO of United Group. "Developers started building pur- pose-built properties instead of the multifamily product and began leasing to students. That's when REITs started to take notice and cap rates started to compress. My guess is everyone is trying to find the right nomenclature to make it feel and sound like active living and not a nursing home." The National Investment Center for Seniors Housing & Care (NIC) does not collect data at this time on the active-adult, 55-plus sec- tor, according to Beth Mace, NIC's chief economist and director of outreach. NIC classifies active-adult com- munities as single-family, for-sale homes, townhomes, cluster homes, mobile homes and condomini- ums with no specialized services, restricted to adults at least 55 years of age or older. NIC defines senior apartments as a multifamily residential rental property restricted to adults at least 55 years of age or older. "These properties do not have a centralized kitchen and generally do not provide meals to residents, but they may offer community rooms, social activities and other amenities," says Mace. 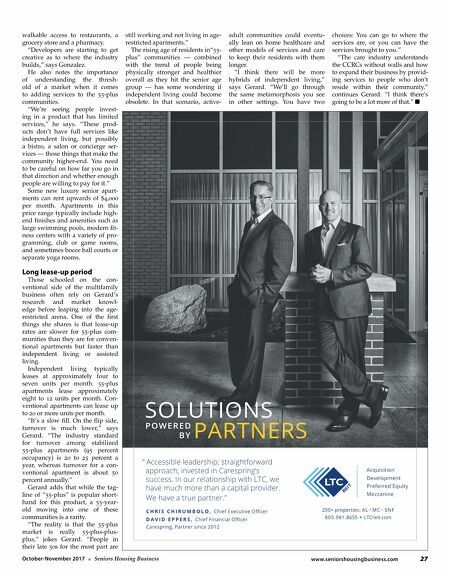 CBRE classifies senior apart- ments as being "similar to apart- ments but which may have a special access and common-area designs." The minimum age eligibility for entry to senior apartments can vary from 55 to 75, according to CBRE, and the average length of stay is between five and 12 years. The products coming to market today are courting varied demo- graphics and markets. KTGY's Manny Gonzalez says the rental products in very high demand are led by tax-credit financed apartments for seniors on fixed incomes (see sidebar about OneStreet Residential's evolution of this product). Beyond that, Gonzalez says most people in the 55-plus market don't want to be segregated like they used to be. "I think there are even issues of whether a CCRC really has legs anymore," he says. "Many don't want to carry the stigma of being in a 'senior' community." To that end, KTGY has designed properties such as Azulon at Mesa Verde in Costa Mesa, Calif., a 55-plus apartment community built over a stalled second phase of a shopping center that backs up to the first phase. This gives residents OneStreet Residential's Hearthside Club at Tucker, in Tucker, Ga., combines affordable- rate and market-rate units. According to the company, demand was so great for both units that the market-rate apartments actually garnered higher rents than conventional multifamily rents in Tucker as well as in adjacent metro Atlanta.